Purpose Assessment of age group-dependent detection rates of invasive breast cancers among participants in mammography screening including the interval, classified into immunohistochemical subtypes indicating the intrinsic tumor aggressiveness. Materials und Methods The target population comprises women aged 50 – 69 years. All invasive breast cancers diagnosed in one screening (sc) unit during the implementation phase 1/2006 – 12/2010 or identified by the cancer registry during the biennial interval (iv) were categorized based on hormonal-receptor status (HR) and Her2-expression (Her2) into the following subtypes: a) HR+ Her2-, b) HR+ Her2 +, c) HR– Her2 + or d) HR– Her2– (triple-negative); Her2 + and triple-negative types were defined as aggressive. The calculated detection rates (DR, ‰) were based on 53 375 sc-examinations and for the interval on 52 887 sc-negative examinations. Results The DRs of all subtypes were higher in screening versus the interval: (a) 4.95 ‰ (n = 264) vs. 1.00 ‰ (n = 53); b) 0.92 ‰ (n = 49) vs. 0.25 ‰ (n = 13); c) 0.36 ‰ (n = 19) vs. 0.06 ‰ (n = 3); d) 0.39 ‰ (n = 21) vs. 0.19 ‰ (n = 10). 77.4 ‰ (89/115) of all aggressive breast cancers including the following 2-year interval were diagnosed by screening. The sum of the DR of aggressive cancers was 1.67 ‰ in screening and 0.49 ‰ in the interval; the corresponding DRs for women aged 60 – 69 years [sc: 2.24 ‰ (51/22 814), iv: 0.58 ‰ (13/22 536)] were higher than among women aged 50 – 59 years [sc: 1.24 ‰ (38/30 561), iv: 0.43 ‰ (13/30 351)]. Conclusion Screening has the potential for earlier diagnosis of aggressive tumor types as its detection rate is about three-fold higher compared to the interval. Within the target group, participants aged 60 – 69 years are at risk based on absolute numbers. They show a nearly two-fold higher detection rate of Her2-positive or triple-negative tumors compared to the age group 50 – 59 years. Her2-positive and triple-negative detection rates are higher in screening than in the interval. 77 % of aggressive subtypes are diagnosed by screening, 23 % during the 2-year interval. The detection rate is highest among women aged 60 – 69 years in screening. Interval cancers are breast cancers diagnosed in the interval, i. e., the time between two screening examinations. It is known that interval cancers include more aggressive phenotypes with a higher histological grade, higher TNM stage, and higher percentage of hormone-receptor-negative, Her2-positive and triple-negative cancers than cancers detected during screening . Estrogen and progesterone receptors, collectively referred to as hormone receptors (HRs), and the human epidermal growth factor receptor (human epidermal growth factor receptor 2; Her2) are biomarkers that express breast tumors  . Based on the St. Gallen consensus recommendations , the determination of these immunohistochemical markers for invasive breast cancers is established in clinical practice based on their predictive information and can be used to analyze the intrinsic aggressiveness . Since among participants in mammography screening over 75 % of all breast cancers occurring in a 2-year period are detected in screening and consequently a significantly lower percentage of cancers are diagnosed in the interval , distribution analyses of subtypes are based on uneven group sizes for screening and the interval. The mammography screening program makes it possible to evaluate breast cancer diagnoses in relation to performed examinations with differentiation of the interval based on the systematic documentation of all screening examinations together with a cancer registry comparison. The goal of the present scientific study is to determine the age group-related detection rates of invasive breast cancers among participants in the mammography screening program including the interval, differentiated according to immunohistochemical subtyping as a parameter of intrinsic tumor aggressiveness. The German mammography screening program is based on the European guidelines  . The target group for structured early breast cancer detection includes women between the ages of 50 and 69 years who receive a written invitation to participate in screening every two years. After screening mammography is performed at a certified unit, the examination undergoes an independent second reading. In the event of an abnormal finding, the case is discussed at a consensus conference including both interpreting physicians and the physician responsible for the program in order to determine whether the patient should be referred for further workup. All screening processes and results are documented in specialized software which can be used to transfer data to the state cancer registry . Data regarding all women who participated in a mammography screening program at a screening unit between January 2006 and December 2010 were included. This period of the implementation phase includes initial and subsequent examinations. The screening examinations were digital (MicroDose Mammography MDM, L30, Philips Healthcare, The Netherlands; Mammomat 3000 Nova, Siemens Healthcare, Germany, DirectView CR 975 EHR, General Electric, US, with DirectView CR 975, Carestream Health, Germany). A digital full-field mammography system (Selenia; Hologic, US) and a high-resolution ultrasound unit (Acuson S2000; Siemens Healthcare, Germany) were used for further diagnostic workup  . All relevant screening data were documented using the screening software (MaSc; KV-IT, Dortmund, Germany). Interval cancers occurring in a 2-year period after participation in screening by December 2012 were determined based on the digital reporting of screening participation without detection of breast cancer (negative screening examination) in the state cancer registry. A documentation delay of other report sources of an additional two years was taken into consideration. The pseudonymized data were reported to the screening unit . In the defined period, 53 375 screening examinations were performed (62.2 % initial examinations, 37.1 % regular subsequent examinations, 0.7 % irregular subsequent examinations defined as repeat screening participation more than 30 months after the last screening examination). Two screening examinations were not able to be fully completed and further diagnostic workup was not able to be performed in 49 cases. As a result, the screening process was not fully completed in 0.1 % of the included examinations. Interval cancer did not occur in any of these cases. The invasive breast cancers diagnosed in screening (n = 359) and in the interval (n = 84) were assigned based on the clinical data regarding hormone receptor status (HR: estrogen receptor and/or progesterone receptor) and Her2 expression (Her2) to the following subtype groups: a) HR+ Her2-, b) HR+ Her2 +, c) HR– Her2 + or d) HR– Her2– (triple-negative). The Her2-positive and triple-negative carcinomas formed the group of aggressive carcinomas. Due to incomplete data, 6 cancers diagnosed in screening (1.7 %) and 5 in the interval (6.0 %) could not be classified. 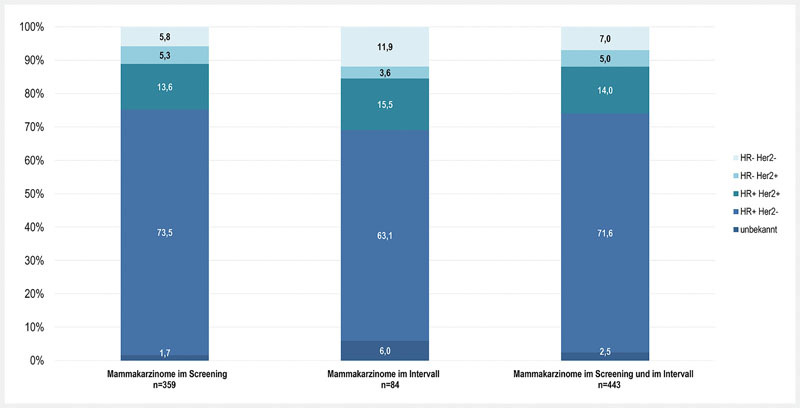 The proportions of immunohistochemical subtypes of invasive cancers among all invasive cancers diagnosed in screening, in the interval, and in the 2-year period (screening plus interval) were recorded. The detection rates per 1000 examinations were related to all screening examinations in screening and to all screening-negative examinations in the interval. Screening-negative examinations did not result in diagnosis of an invasive breast cancer or in diagnosis of a ductal carcinoma in situ (DCIS) within the screening program. According to the above definition, the DRs were calculated for screening and the interval with classification according to subtype including differentiation of the age groups 50 to 59 years and 60 to 69 years. Among the invasive cancers, the percentage of UICC stage I (pT1 pN0 cM0; histological tumor diameter up to 2 cm, not metastasized)  aggressive cancers detected in screening or in the interval were identified as an early tumor stage, while the other invasive diseases with a primary tumor greater than 2 cm and/or metastasis were designated as advanced stages (stage II+). Diseases having undergone neoadjuvant therapy were excluded from this subanalysis due to the inability to determine the histological tumor size at the time of diagnosis. All analyses were performed using SAS software version 9.4. 359 of the 53 375 examinations performed as part of the screening program were diagnosed as invasive breast cancers, corresponding to a screening detection rate of 6.73 ‰. There was a total of 52 887 negative screening examinations after subtraction of the 359 examinations resulting in diagnosis of an invasive breast cancer and the 129 examinations resulting in diagnosis of DCIS. Among the 52 887 negative screening examinations, 84 invasive breast cancers occurred in the two-year interval, yielding a corresponding detection rate of 1.59 ‰. 81.0 % (359/443) of all invasive breast cancers and 77.4 % (89/115) of all aggressive breast cancers including the subsequent 2-year interval were diagnosed in screening. The percentage frequency distribution of the defined subgroups of all invasive breast cancers is shown in [Fig. 1]. Aggressive Her2-positive and triple-negative cancers comprised 89 of 359 (24.8 %) invasive cancers from screening, 26 of 84 (31.0 %) invasive cancers from the interval and 115 of the total 443 (26.0 %) invasive cancers from screening and the subsequent interval (2-year period). Fig. 1 Percentage distribution of invasive breast cancers by subgroups and detection mode. HR+: hormone-receptor-positive, HR–: hormone-receptor-negative, Her2 +: Her2-receptor-positive, Her2–: Her2-receptor-negative, unknown: receptor-status unknown. [Fig. 2] shows higher detection rates for all subgroups of invasive breast cancers a-d, as defined in the Materials and Methods section, in screening than in the interval: a) 4.95 ‰ (264/53 375) vs. 1.00 ‰ (53/52 887); b) 0.92 ‰ (49/53 375) vs. 0.25 ‰ (13/52 887); c) 0.36 ‰ (19/53 375) vs. 0.06 ‰ (3/52 887); d) 0.39 ‰ (21/53 375) vs. 0.19 ‰ (10/52 887). Fig. 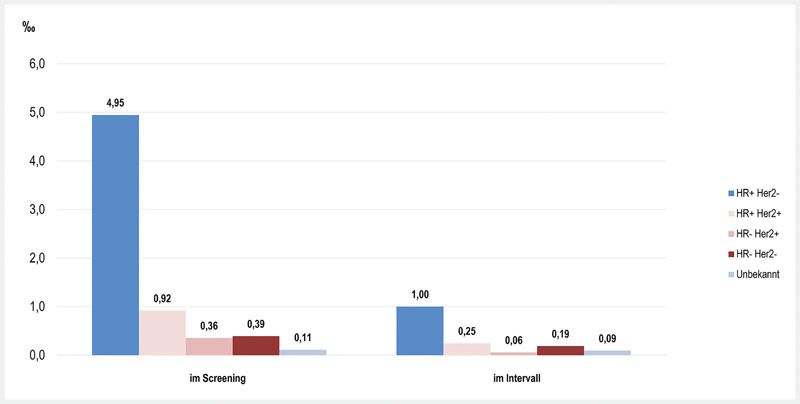 2 Detection rates (‰) of invasive breast cancers in screening and in the interval per subtype. HR+: hormone-receptor-positive, HR–: hormone-receptor-negative, Her2 +: Her2-receptor-positive, Her2–: Her2-receptor-negative, unknown: receptor-status unknown. The sum of the detection rates for the aggressive Her2-positive and triple-negative groups was 1.67 ‰ (89/53 375) in screening and 0.49 ‰ (26/52 887) in the interval. The detection rates in screening compared to the interval for hormone receptor-positive and Her2-positive cancers, hormone receptor-negative and Her2-positive cancers, and triple-negative cancers were 3.7, 6, and 2.1 times higher, respectively ([Table 1]). Number of invasive breast cancers and detection rates (‰) of different subtypes by detection modus. HR+: hormone-receptor-positive, HR–: hormone-receptor-negative, Her2 +: Her2-receptor-positive, Her2–: Her2-receptor-negative, unknown: receptor-status unknown. Among the aggressive subtypes, 1 of 89 (1.1 %) breast cancers detected in screening and 1 of 26 (3.8 %) cancers detected in the interval were treated with neoadjuvant therapy. Additional analysis of the postoperative clinical stage of the breast cancers not treated with neoadjuvant therapy showed an early tumor stage (stage I) in 55.7 % (49/88) of the invasive Her2-positive and triple-negative cancers detected in screening. The corresponding percentage was lower in the interval [28.0 % (7/25)]. Among the aggressive subtypes, advanced tumor stages (stage II+) were seen in 44.3 % (39/88) of cases detected in screening and 72.0 % (18/25) of cases detected in the interval. The percentage of triple-negative cancers among the aggressive invasive stage I breast cancers was 30.6 % (15/49) in screening and 28.6 % (2/7) in the interval. Age differentiation showed a higher detection rate of all invasive breast cancers among 60 – 69 year-olds both in screening and in the interval and a higher detection rate of aggressive Her2-positive and triple-negative cancers compared to the group of 50 – 59 year-olds. In both age groups, the detection rate for aggressive cancers was higher in screening than in the interval. For the hormone receptor-positive and Her2-negative subtypes, the detection rate in screening among 60 – 69 year-olds compared to 50 – 59 year-olds was higher. However, these rates were similar in the interval. In the group of 60 – 69 year-olds, 24.9 % (64/257) of all invasive breast cancers in the 2-year period (screening plus subsequent interval) were aggressive, while the percentage was 27.4 % (51/186) in the group of 50 – 59 year-olds. Details regarding the age group calculations are provided in [Table 2]. Number of invasive breast cancers and detection rates (‰) of different subtypes by detection mode and age group. The analysis of gene expression profiles identified molecular subtypes of breast cancer that differ significantly with respect to their clinical course and treatment response: Luminal A and luminal B, Her2-positive, basal-like . Based on the St. Gallen consensus recommendations, a simplified non-identical classification in which tumors are differentiated in a treatment-oriented manner on the basis of an immunohistochemical algorithm, particularly based on hormone receptors and Her2 status, was established in the clinical routine . It is known that hormone receptor-positive and Her2-negative breast cancers have a better prognosis than Her2-positive and triple-negative cancers . The goal of the current study is to differentiate and quantify cancer detection in screening and in the interval according to biological aggressiveness. Accordingly, the subgroup with the highest percentage in screening (73.5 %) and in the interval (63.1 %) is comprised of the more prognostically favorable hormone receptor-positive and Her2-negative breast cancers. 26 % of all invasive cancer diagnoses from screening and the subsequent interval include aggressive forms which can be categorized as either a Her2 expression or the triple-negative subtype. The percentage is approximately 1 % lower in the 60 – 69 year-old group and approximately 1 % higher in the 50 – 59 year-old group. In concordance with the literature, the percentage of aggressive cancers in the total group was lower in screening (25 %) than in the interval (31 %) . 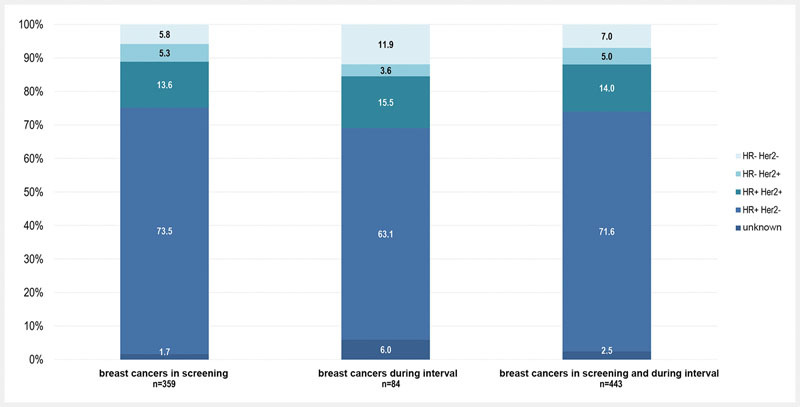 This perspective is based on a different group size since 81 % of all invasive breast cancers were detected in the screening program and consequently 19 % in the interval in the current study. The corresponding percentage of aggressive breast cancers detected in screening was in 77 %. For an early detection program, the absolute frequency of cancer diagnoses is also of interest. By registering all screening examinations in the state cancer registry, analyses can be performed on the basis of all examinations and not just diagnosed cancers. This analysis option provides an expanded view of diagnosis rates. This study shows that all invasive subtypes have higher detection rates in screening than in the interval. This also applies to the aggressive types with an approximately three times higher detection rate in screening on average. The factor is highest among hormone receptor-negative and Her2-positive cancers (six times). Given an increasing rate of breast cancer with increasing age , with an emphasis on hormone receptor-positive and Her2-negative cancers, 60 – 69 year-olds have a higher incidence of aggressive subtypes than 50 – 59 year-olds. 60 – 69 year-olds have a 3.9 times higher detection rate for aggressive breast cancers and 50 – 59 year-olds have a 2.9 times higher rate in screening than in the interval. In screening aggressive invasive cancers are diagnosed early at stage I in 56 % of cases. In contrast, advanced stages dominate in the interval (percentage of stage I: 28 %). It must be taken into consideration that the screening detection rate represents the incidence at a particular point in time and the interval detection rate is the incidence over a 2-year period. Particularly in aggressive breast cancers with faster growth, the chance of being diagnosed at a higher tumor stage than in the case of an interval cancer is high. Stage I according to UICC is a relevant diagnostic effectiveness parameter and includes smaller primary tumors with a diameter of up to two centimeters without regional lymph node involvement or distant metastasis at the time of diagnosis . The survival advantage for hormone receptor-negative cancers is greater for screening detection due to downstaging than for hormone receptor-positive cancers . A current study regarding breast cancer mortality from the USA shows that both screening as well as treatment influence the decrease in breast cancer-specific mortality with variations for the subtypes. The relative influence of screening compared to treatment is higher for triple-negative cancers than for other subtypes . In certain high-risk groups for aggressive cancers such as gene mutation carriers, a shorter time interval between early detection examinations of less than two years has become established . A strength of our study is that the state cancer registry was able to provide cancer detection data including interval cancers in a systematic and standardized manner at the start of screening implementation. The percentage of unknown subtypes was low due to a lack of data. Analysis of the postoperative UICC tumor stages of aggressive breast cancers without preoperative systemic therapy was largely possible for the study group. As a result of current changes to the recommendations regarding neoadjuvant therapy, the comparison of postoperative data will no longer be possible to the same extent in the future . It could be a limitation that the evaluation is based on the results of a single screening unit and thus may not be able to be transferred to other units. Due to the limited number of cases in the subgroups, statistical testing and additional analyses regarding age-specific tumor stages was not performed. The present study relates to the time period of the introduction of the screening program which primarily includes initial examinations. When the program was first introduced, initial examinations were distributed across the entire target population of 50 to 69 year-olds. First-time participants in the nationally established program now tend to be younger, typically 50 years old. Possible effects of changes in initial vs. subsequent examinations may limit transferability, particularly in regard to the composition of the age groups, to an implemented screening program. In the case of regular participation in subsequent screening, the percentage of slow-growing luminal A cancers with low grading will decrease. Among participants in mammography screening, the detection rates of aggressive Her2-positive and triple-negative invasive breast cancers is higher in screening than in the interval. In concordance with the higher incidence of breast cancer in older women, 60 – 69 year-olds represent a risk group for the detection of aggressive invasive breast cancer. Mammography screening has the potential to allow early diagnosis with an approximately four times higher detection rate in this age group and with an approximately three times higher detection rate in the entire study group in screening than in the interval. On average, during the implementation phase of the biennial digital mammography screening program, the detection rate for aggressive invasive cancers is three times higher in screening than in the interval, is six times higher for hormone receptor-negative + Her2-positive cancers and two times higher for triple-negative cancers. The stage distribution of aggressive invasive breast cancers is more favorable in screening than in the interval. Aggressive invasive breast cancers are diagnosed with the highest rate among 60 – 69 year-olds in screening, while the percentage of aggressive cancers diagnosed in the 2-year period is 25 %. Abb. 1 Prozentuale Verteilung invasiver Mammakarzinome nach Subgruppen und Detektionsmodus. HR+: Hormonrezeptor-positiv, HR–: Hormonrezeptor-negativ, Her2 +: Her2-Rezeptor-positiv, Her2–: Her2-Rezeptor-negativ, unbekannt: Rezeptorstatus unbekannt. Abb. 2 Detektionsraten (‰) invasiver Mammakarzinome im Screening und im Intervall pro Subtyp. HR+: Hormonrezeptor-positiv, HR–: Hormonrezeptor-negativ, Her2 +: Her2-Rezeptor-positiv, Her2–: Her2-Rezeptor-negativ, unbekannt: Rezeptorstatus unbekannt.